With over 300 days of sunshine per year, solar makes sense! Find out how much you can save by switching to solar with $0 down. 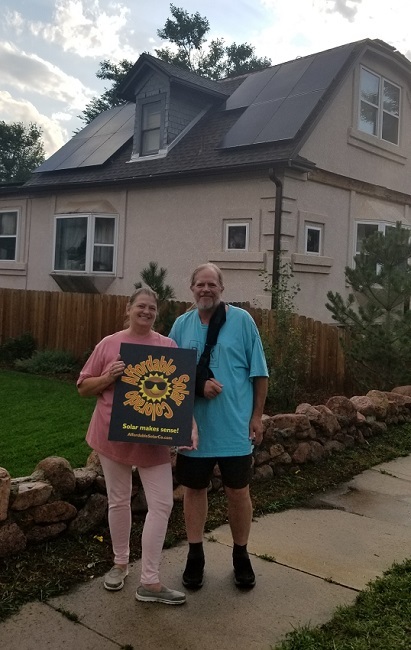 The Affordable Solar Colorado team provides solar power excellence in Colorado Springs, Colorado and surrounding areas. Our team members have expertise adapting solar power systems to meet your unique needs. To schedule a consultation at your residence or place of business, contact us. We can help you save money while using a clean energy alternative. Our pledge to you is to deliver honest evaluation, fast installation, and affordable, quality products. Our team includes a local, family owned and operated solar installation company that is licensed, insured, NABCEP certified and has a great reputation in the community. Our team prides itself on providing unique solar solutions for each customer and making solar affordable! We will listen to your goals and do our best to achieve the most efficient use of solar power in your home or business. Contact us to find out if solar makes sense for you. Currently there are 200,000+ homes in Colorado powered by solar and that number is growing quickly. Why? Because with unlimited energy from the sun, solar works. Own your electricity instead of renting and become independent of your utility company landlord. "Solar on our roof powers our home and our electric car. Not only do we no longer purchase our electricity from the utility company, we also no longer purchase gas or require oil changes for our solar powered automobile!" Solar power as an electrical source for your home or business is the clean alternative to electricity created from burning fossil fuels. You can enjoy saving money and reduce your carbon footprint with solar. Harvesting the power of the sun, many solar power customers reduce their consumption by 50% or more. In some cases, clients actually get paid from the electric company for excess clean energy. We can maximize the benefits your solar system provides. The team as Affordable Solar Colorado is passionate about solar energy and its many possibilities. We are committed to providing you with an honest evaluation of your home or business to determine if solar makes sense for your needs. Installing a solar panel system today is much less costly than when systems were first released. As more companies begin to manufacture solar panels and technology advances, prices continue to drop. We can provide you with a cost estimate and help you explore tax incentives.